Leg ulcers are basically a discontinuity of the epidermis and dermis in the lower limb of more than 6 weeks interval. The veins in your legs have one-way valves that make sure the blood flows up the leg and not back down. If the veins are damaged, blood can flow the wrong way down the veins. This results into a very high pressure in the veins when standing up. It is the abnormal high pressure in the veins that damages the skin and leads to the ulcers. Prevention strategies, early identification and proper management are some of the important steps in improving the life of the patients and reducing the health budget. Laser veinremoval is a simple, non-invasive, adjunctive and a low level laser therapy that assists in both wound closure and accelerates time for wound closure. It up regulates essential wound healing factors such as vascular endothelial growth factor and tissue granulation among other factors. The vein is ultimately not removed but irreversibly damaged by the heat of the laser. Before performing the vein removal procedure the doctor examines the leg ulcer first. This is to enable him find out how intense the ulcer is. The doctor then uses ultrasound images to allow him to find the vain within the leg and plot the laser along the course of the vein to the desired location. Insertion of the laser tuber into the vein is done through a needle puncture site on the leg. The laser is activated and then slowly pulled back along the inside of the vein. By so doing the blood flow is stopped and thus the venous hypertension is eliminated. The laser vein is recovered by the body over time. After the body eliminates the laser vein; blood flow is redirected to the functioning veins. These veins return the blood to the central circulation. The blood is then directed to the heart and to the lungs. The advantage of laser vein removal is that it improves cellular repair and stimulates the immune lymphatic and vascular system. The fact that it is a pain-free method with minor side effects makes it the best treatment option for those suffering for leg ulcers. The complexity of vein removal requires an expert. 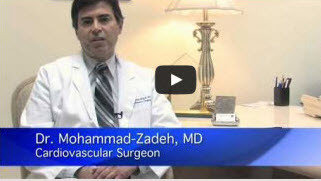 Dr. Zadeh is preferably the best person to conduct the laser treatment of leg ulcers. He is equipped with the necessary skills and equipment to perform the laser treatment for leg ulcers.